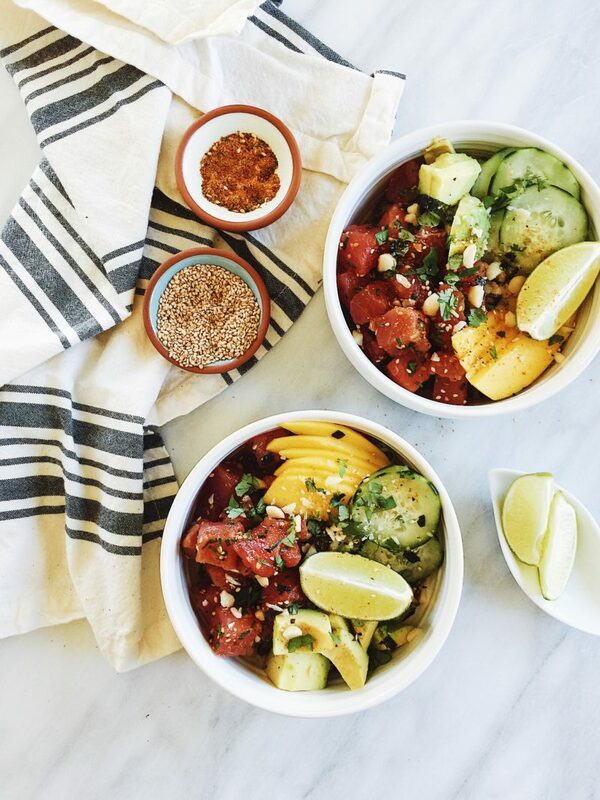 Ahi Tuna Protein Poke Bowls are full of bright, fresh umami flavors. 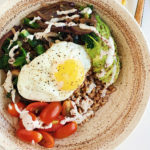 These gluten-free bowls get an extra dose of protein thanks to an organic protein rice blend with brown jasmine rice, red quinoa, and lentils. Mahalo! Even just looking at poke instantly takes me back to Hawaii. And with first bite, I’m back on the beaches of Oahu, grabbing an ono poke bowl from a local food truck, handed to me with a smile and bamboo chopsticks, to be taken to the closest bench with the prettiest view. And aren’t all views the prettiest views in Hawaii? With the slight breeze, the salty beach air, and the constant harmonious hum of the calmest waves crashing in the clearest aquamarine ocean, I’ll sit in silent wanderlust and enjoy every bite of the aforementioned poke bowl. How can something so simple be so delicious? There’s not even actual cooking involved. Just the freshest, pinkest pieces of raw Yellowfin ahi tuna, line-caught year-round in those very same aquamarine shores. 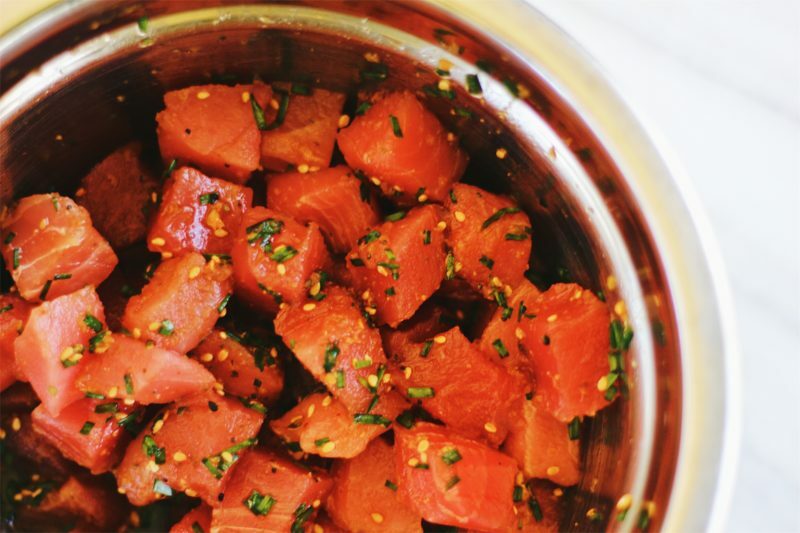 Poke (Hawaiian for “to cut into pieces”) has been popular in Hawaii for centuries, with evidence of its existence dating as far back as the arrival of the first Hawaiians. It can be found at markets, restaurants, food trucks, and luaus. 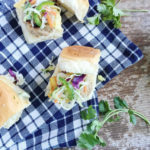 It’s definitely seen more as a pupu (snack) than a full meal there, as locals grab a quarter-pound of it to-go from a local fresh market, or split it between friends for an afternoon pau hana (happy hour). However, add some tasty toppings and a bit of grains, and you have a full meal. Or, as they may say in Hawaii, some ono grinds. You can make poke and poke bowls as complicated or as simple as you’d like. In reality, you could just mix some sushi-grade cubed ahi with soy, sesame oil, and a sprinkling of chives. And there you have it. You just made poke. 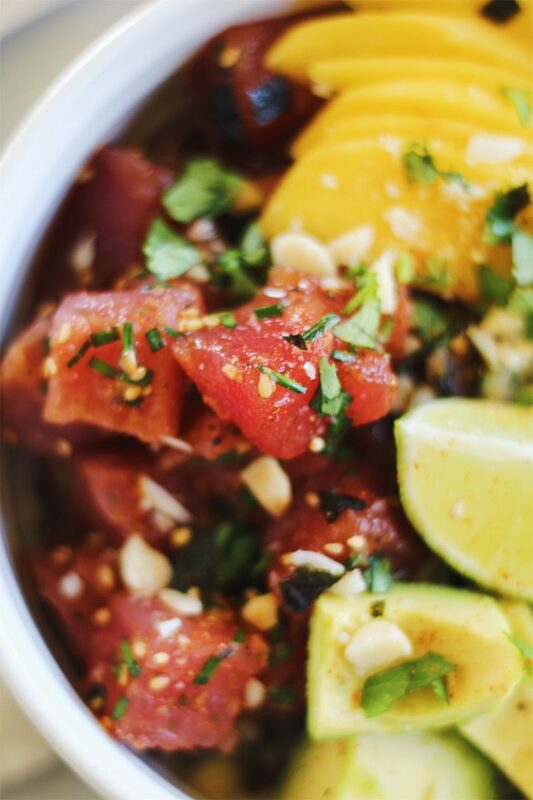 Although poke is typically made with ahi, it can be made with a variety of seafood. Salmon, shrimp, scallops, or tako (octopus), for example. It can be spicy. It can be sweet. It’s always delicious. You can enjoy a scoop (or two) of poke as is, flavored with Shoyu or wasabi, perhaps, and studded with sesame seeds. You can enjoy it in bowl form, layered on top of fluffy jasmine rice and topped with avocado, fried onions, cucumber, seaweed, edamame, or furikake. For these protein poke bowls, I marinate fresh Yellowfin tuna with a blend of coconut aminos, rice wine vinegar, pink Hawaiian sea salt, sesame seeds, sesame oil, chives, grated ginger, red pepper flakes, and togarashi. I love coconut aminos, but you could use Tamari (gluten-free soy sauce) here instead. Togarashi is a blend of seven different Japanese spices, including spicy dried chili peppers, orange peel, ginger, and seaweed. 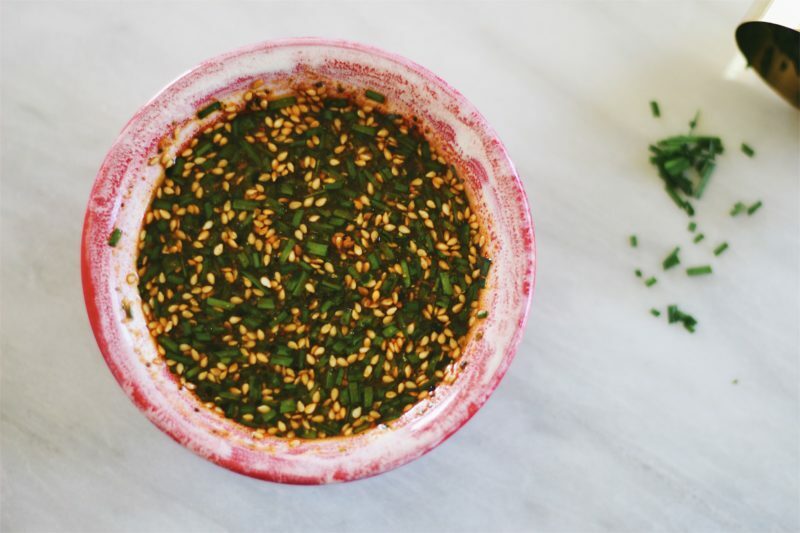 Furikake (a sesame and seaweed blend) is another common poke seasoning you can use instead, which doesn’t have the spicier heat. 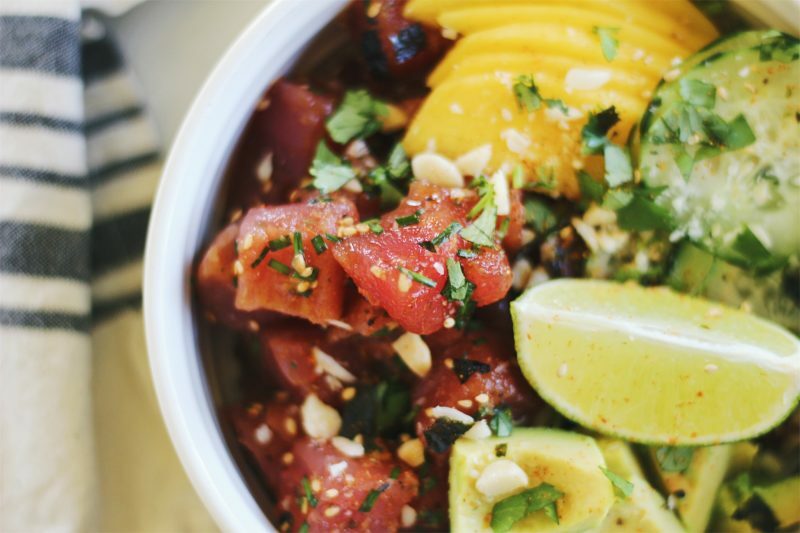 What makes these Ahi Tuna Protein Poke Bowls so full of protein? Yellowfin tuna is an excellent source of protein. In fact, one 6-ounce serving fulfills 90% of the daily recommended value for protein (for women; 75% for men). 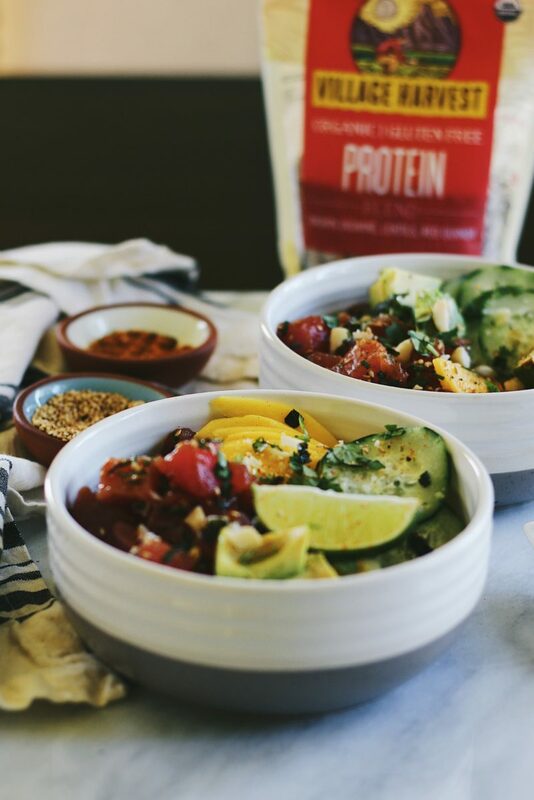 But to up the protein ante even further, instead of layering my poke bowls with white rice, I opt for the nutrient-dense and protein-packed Village Harvest Organic Protein Blend. 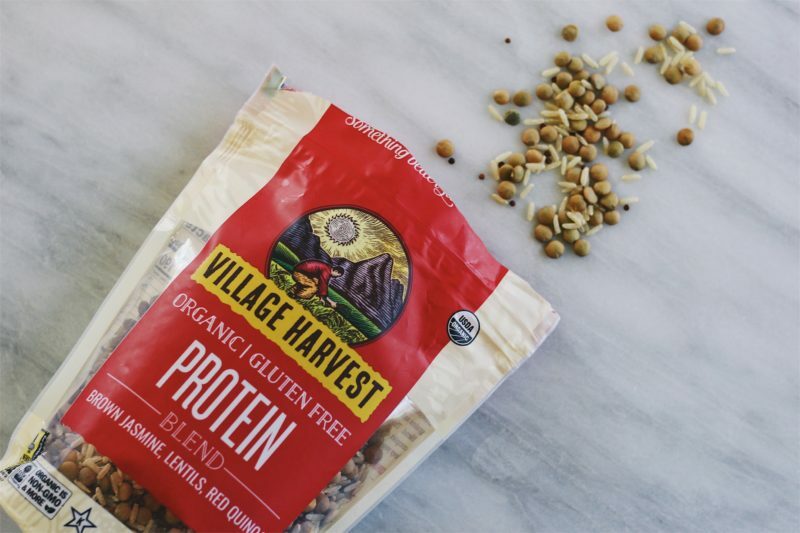 This organic, gluten-free blend is composed of a mix of brown jasmine rice, lentils, and red quinoa. And that’s it. No added ingredients or unnecessary stuff in there. 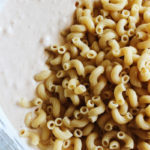 The blend is loaded with complex carbohydrates, protein, and dietary fiber. And it’s delicious. It helps keep me fuller for longer thanks to its 8g of protein and 5g of fiber per serving. 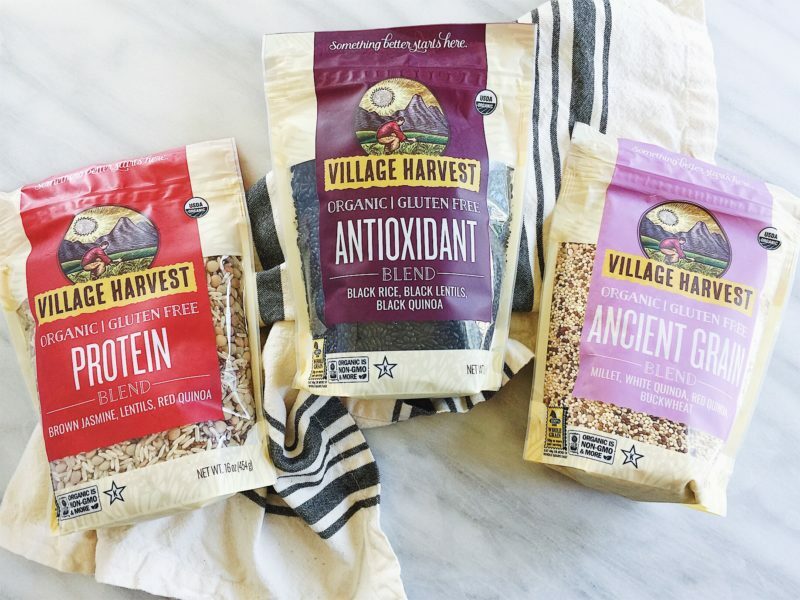 I love all of the ‘blends’ that Village Harvest offers, including their Organic Antioxidant Blend (black rice, black lentils, and black quinoa) and their Organic Ancient Grains Blend (millet, red and white quinoa, and buckwheat). 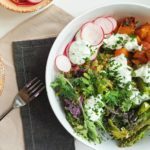 These gluten-free, organic blends offer more nutritional value than just my go-to brown rice, and also much more variety. 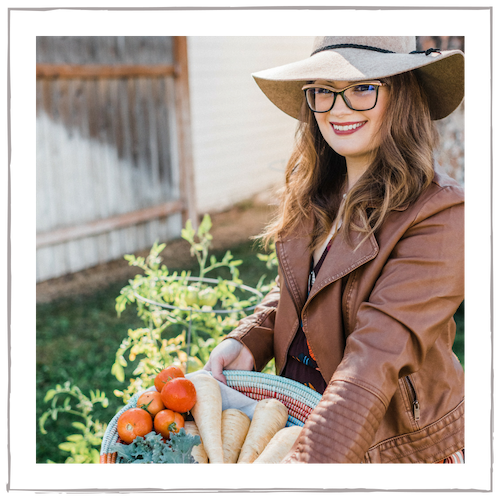 I love supporting Village Harvest because they practice social sustainability, run charitable programs to support farmers and local communities, and even donate 1% of their employees’ time to charitable causes and sustainability efforts. Being someone who is so involved with charity and volunteering, I always feel incredibly good about purchasing Village Harvest. Then, the fun part: the toppings. Mango for a bit of sweetness. Fresh lime for some acidity and brightness. Cucumber and cilantro for balancing and cooling. Some more togarashi for umami factor. Seaweed and sesame seeds to round everything out. 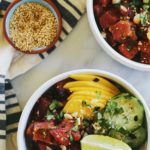 I hope that you make and enjoy these Ahi Tuna Protein Poke Bowls! 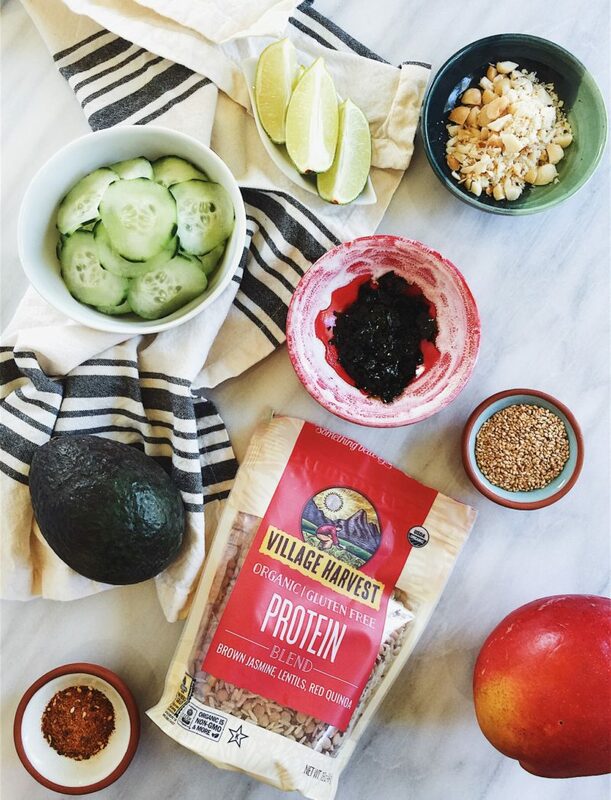 Check out Village Harvest’s unique and nutritious rice blends for creating your favorite healthy summer meals. If Village Harvest isn’t sold near you, fill out this request form to get it into your favorite local store! Place cold, cubed ahi tuna in a medium bowl. Whisk together the coconut aminos, rice vinegar, sesame oil, sesame seeds, togarashi, grated ginger, chives, salt, and red pepper flakes. Pour the sauce over the ahi and stir very well, but gently, to combine. Wrap in plastic and refrigerate the ahi for 30 minutes. While the ahi is chilling, cook 1 cup of the dry rice blend according to package directions. Divide the rice amongst four bowls. 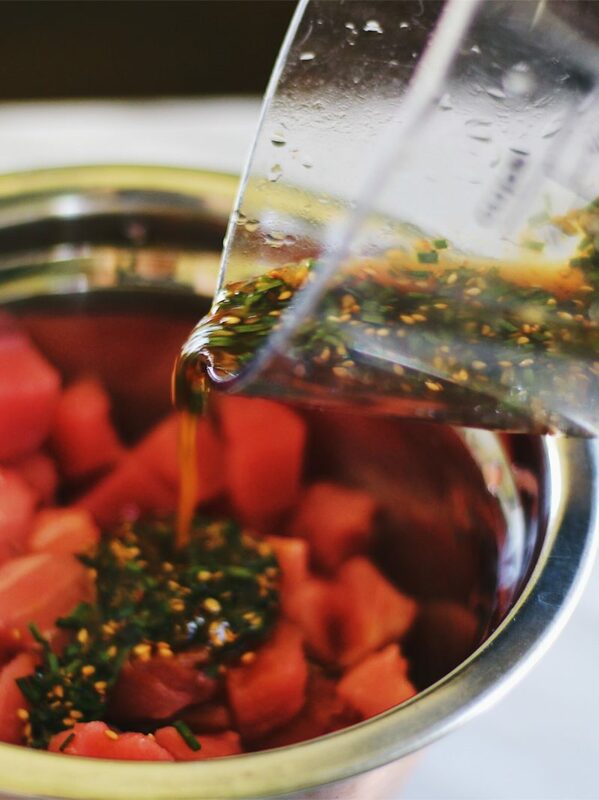 Divide the marinated ahi poke between the bowls. 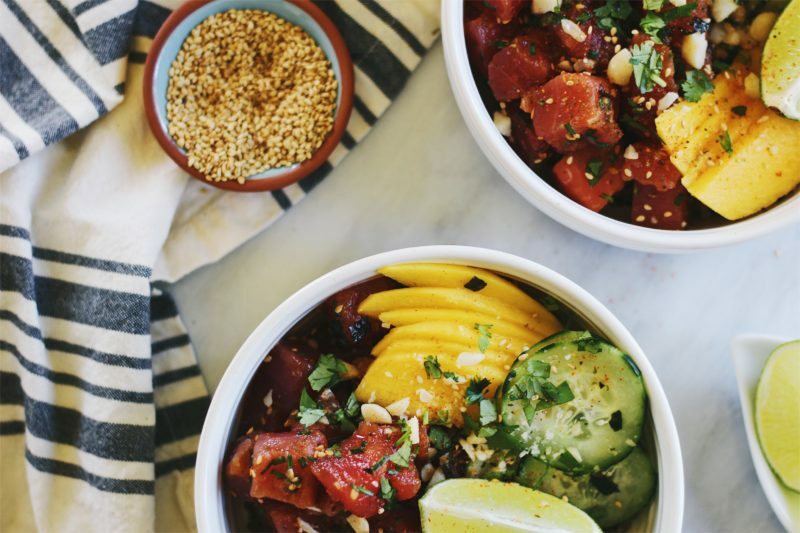 Top the poke bowls with your desired choice of toppings, such as thinly sliced mango, avocado, cucumber, sesame seeds, fresh cilantro, and macadamia nuts. Squeeze with a wedge of fresh lime and sprinkle with either togarashi, furikake, or nori seaweed flakes. Enjoy! That looks so delicious, something my better half would love for me to make. 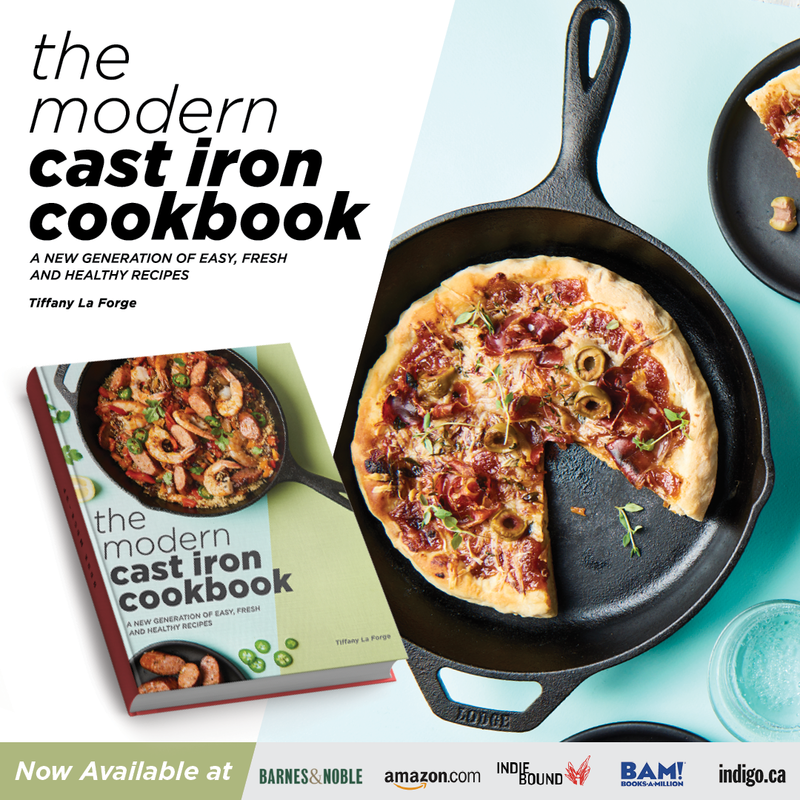 Might have to try your recipe out soon! On this hazy hot drab Thursday, this post almost made me cry – I miss Hawaii so much! These bowls will be a great way to travel back there without the $348902853.99 ticket price haha. Seriously this looks so good! I am a huge fan of togarashi so I will probably adorn these bowls with a heavy shake. Man, these photos are really making me drool. Excellent post and now I can’t wait to get my hands on some of this, and maybe still try to get to Hawaii again sometime this lifetime haha. Ive been craving a poke bowl so badly and now I see your poke bowls and they look amazing. Now I know I definitely need to get one. I love a good ahi tuna and spicy tuna on mine personally. Tuna is super good so I’m sure this tuna bowl is super amazing! This looks really good! Have never tried anything like this before so will have to try it soon. Looks and sounds delicious. Poke bowls are gems to me and most satisfying. A common food in Hawaii but definitely out of course to mine. But wow, thanks to this recipe as I never knew it is simple as this. You’re welcome! I admit I was very intimidated by making poke too before I learned how simple (and delicious) it really is! I keep hearing about poke bowls lately. 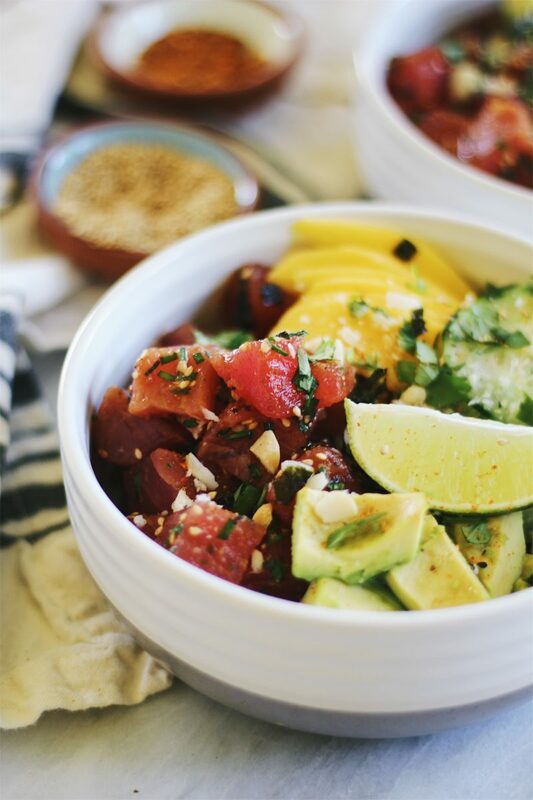 Your Ahi Tuna Protein Poke Bowls sounds super savory and delish! 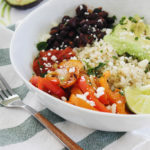 this looks great i can imagine the taste especially with avocadoes and mango added. These blends are so good. I always have them in stock. 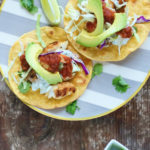 they come in super handy to make a quick weeknight meal for sure. Are you a fan of raw fish in general? You can make poke with other types of fish! Ahi is definitely the most common, but octopus, shrimp, and salmon are popular choices too. This looks absolutely amazing. The marinade for the tuna sounds really delicious. This does look yummy! We had Ahi last night – but it was prepared as Tuna steaks. I’ll have to give this a try next time. Now this sounds like a really delicious and different dish. I could definitely give it a try. Those look absolutely scrumptious. I’m a huge fan of ceviche, sushi, and tiradito which are all in the same ballpark. Can’t wait to make this. Agree! I could eat ceviche and sushi pretty much everyday. I didn’t know what tiradito was so I had to look it up, and now I want it!! My cousin is half Peruvian and always takes me to some amazing Peruvian restaurants so I need to ask her if she knows about this/where to find it!